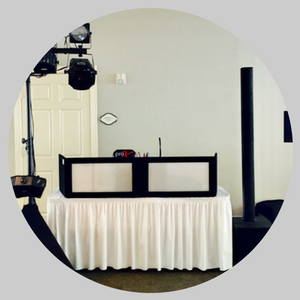 When you recruit us for DJ services you can count on the best of the best. We've heard it all----DJs who show up with nothing more than an ipod and speaker or just don't show up at all. That's wont be the case with us. We care deeply about ensuring that every party we perform at creates a memorable experience that guests can enjoy. Our music library includes over 25,000 songs ranging from 1950s to today's best hits! We've been in business for 17 plus years and we've done over 100 events of all types. 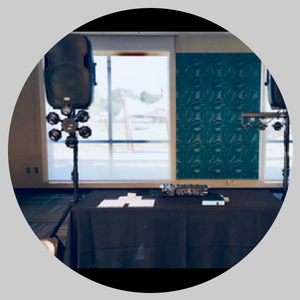 We're also fully insured; our services are perfect for homecoming, school dances, wedding receptions, birthday parties, corporate events, fundraisers, graduation celebrations, and all types of outdoor events. We use 100% LED lighting to really give you that night-life party experience in addition to custom monograms and slideshow/video capabilities. Expanded Lighting Package includes 2 banks of colored can lights, 4 FX lights and Slow Dance (Disco Ball) light. 2000W Sound system with 2 large, full-range speakers. We can customize your package to fit your event needs. With every package you will receive 30 plus digital photos that are captured and shared on social media, but take a look below at some of the additions we can add to create that "wow" factor! ****Additional speakers available upon request for nominal fee. Inquire for details and pricing. 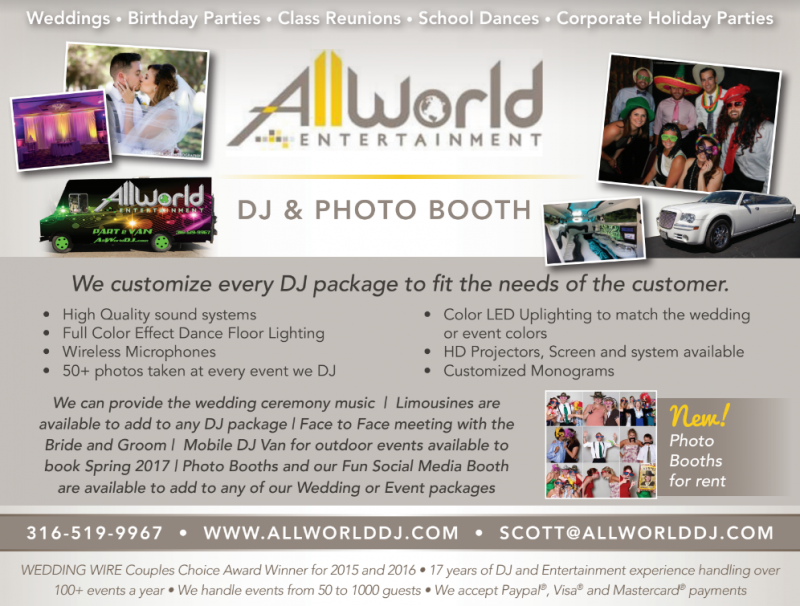 We would like to give a big thanks to Scott and All World Entertainment for making our wedding this past Saturday a huge success! It was a pleasure to work with Scott. Jon and I were pleased at how easy it was to get a hold of him and how closely he worked with us to get everything we needed done! We had a blast at our reception with DJ Kenny! He was very energetic and did a good job keeping people on the dance floor. We were surprised at how well he and the our photographer worked together to keep the evening flowing smoothly. It was also great that he got out on the dance floor with us and he did a great job at the rap battle with our best man :) (which I believe he won!). We would highly recommend them for future events. Thanks again guys for helping us to create some amazing memories!! 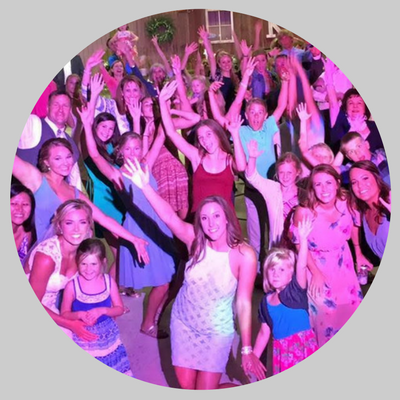 “Scott, you helped make our wedding reception special and enjoyable for our family and guests. We received several compliments about how much fun our wedding reception was. All World Entertainment helped make our reception something that everyone will remember for years to come. I have passed along your name to all my friends that will be getting married in the future. Thanks again for everything you did for us.